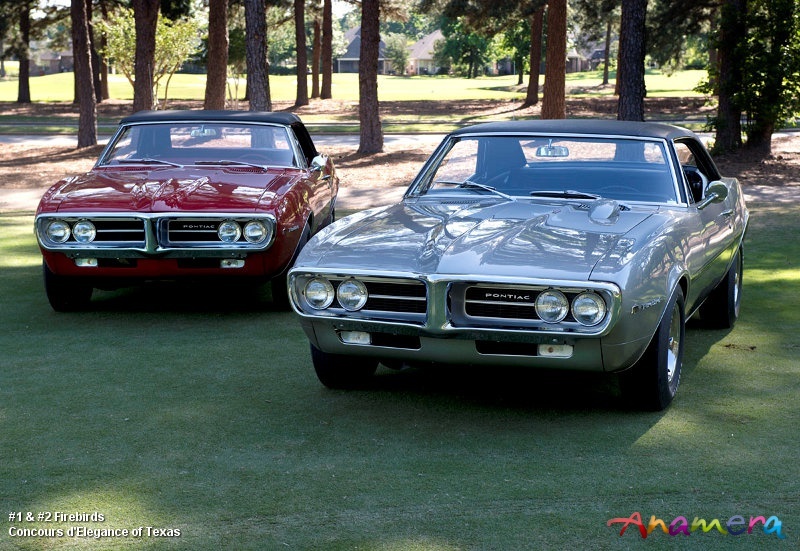 Among the stars of the show at last weekend's Concours d'Elegance of Texas (May 2nd-4th) was a pair of very significant Pontiacs, the first and second Firebirds ever built, on display fully restored to the general public for the first time. Featured on recent episodes of the Discovery Channel's hit show, Fast 'N' Loud, these two outstanding examples from Pontiac's original "Magnificent Five" were bought by Gas Monkey Garage, then fully restored by the team as part of a striking deal with their new buyers. Having acquired the pair, entrepreneur, collector and cowboy, JD Pass and his business partner, a lifelong Pontiac enthusiast, had elected to bring each car back to its former glory so that people could enjoy them as originally conceived, rather than leave them to deteriorate further. The cars and their new owner drew the crowds all weekend long. "I was very pleased to see such a diverse and enthusiastic crowd visit the Firebirds over the weekend, from the families and Dads and Moms who either had or dreamed of having one in High School, to the early teenagers who just thought they were cool," said JD Pass. "It wasn't just fans of Fast 'N' Loud, but the real American salt of the earth enthusiast that took pictures, told stories and truly related the cars to their own experience. These cars have their own fan base! We are so excited and look forward to many more opportunities to expose these wonderful pieces of automotive history to all." Having watched the Ford Mustang and Chevrolet Camaro enter the pony car market, Pontiac had joined the race in 1967, creating a unique identity for its new Firebird. Rather than offer one car with multiple options, it instead presented "The Magnificent Five," each model offered with its own distinctive style and different engine. These Firebirds are serial #'s 100001 and 100002, both factory show cars, as evidenced by the trim tags which read "Show1" for the No. 1 car and "Show4" for the No. 2 car, significant when factory show cars do not usually survive. Pontiac's first Firebird is a 326 Convertible, presented in its original Regimental Red, with cruise control, deluxe interior package in red and a very rare floor mounted clock. Car #2, which took Best in Class at Sunday's Concours, is a 4-speed HO Coupe in Silverglaze, the first High Output car built, with factory-mounted tachometer, Rally II wheels, tilt column and deluxe black interior. The Firebirds are ultimately slated to take pride of place in a new muscle car museum in Colorado.